Stone bathroom worktops – is it a good idea? Although a worktop is most often associated with kitchen, a bathroom can also immensely benefit from a bespoke worktop. We are especially fond of our quartz worktops which are famous for their durability and resistance to outside factors encountered in a typical bathroom – heat and moist which normally deteriorate the state of almost any surface. That is why most bathrooms need renovation every couple of years.. But it is not the case with our bathroom worktops! Due to our experience, we are able to manufacture and install worktops which will last for years to come without the need of maintenance or renovation. 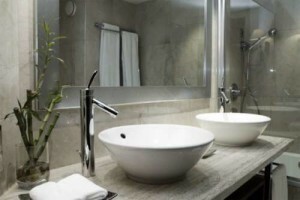 Furthermore, we are able to not only made a beautiful bathroom worktop, but we can also remodel the whole bathroom and cover it with excellent stone material that will make your bathroom both unique and virtually indestructible. Just wipe the moist surface with a cloth – that is all the work you have to do to maintain the splendid looks of your bathroom and the properties of our material. The variety of available patterns, textures and colours we offer makes the whole process of bathroom renovation much easier, as no matter what interior design you have chosen, you can find a stone type that will excellently match the chosen décor. Just browse through our portfolio of marble, quartz and granite worktops and see what we are capable of. You can easily check our work yourself – visit our workshop and see the materials we use to create the best bathroom worktops in England. Take note of our operating areas – we conduct our business mostly along M25 and we deliver our worktops to numerous locations. We are able to provide the fastest service in neighborhoods of London, including Hounslow, Slough, Richmond, Sutton, Westminster, Kensington and Chelsea.